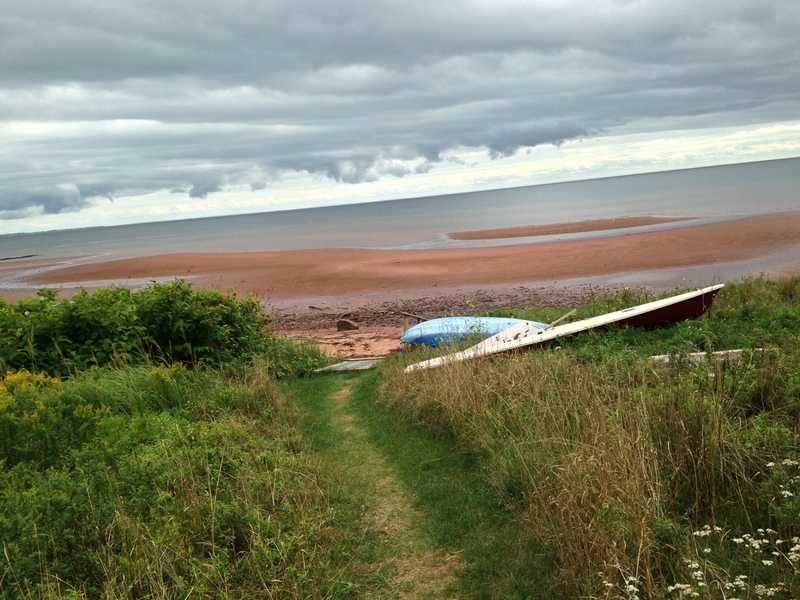 This is a view of Keppoch Beach, in PEI, where my Mom’s family is from. And before I post about the general awesomeness that is the Island, I wanted to talk about something a little more serious. In the wake of the sudden suicide of Robin Williams, much has been written about the importance of acknowledging mental illness and helping those who suffer from it benefit from treatment. Firstly, let me say if you or someone you care about suffer from Depression or Anxiety, please speak to your doctor. These are serious conditions caused by imbalances in brain chemistry. A variety of useful treatments exist, including medication, therapy, or combinations of these. Cardiovascular exercise, certain supplements, and yoga have also been known to help. And it is VITALLY important to seek treatment. But this post is not really about that. It’s about the external factors that make these treatments WORK. It’s about the Village. We’ve all heard the phrase, “It takes a village to raise a child.” In my ten years of schoolteaching, practicing yoga, and living adult life, I’ve come to believe it takes a village to do most things. It takes a village to stage a school musical, keep a Mysore program running, move houses and renovate, come to terms with grief. And for Mental Illness, it really takes a Village to support someone’s recovery. So here’s what you need to know: it’s not enough to post heartfelt Facebook tributes to Robin Willians and pay lip service to the importance of treating Depression. Treatment itself is not enough. It needs to be supplemented with love, human contact, laughter. You need to show your support for your depressed parent, sibling, or friend with ACTION. How do you do this? REACH OUT. You are NOT off the hook if you are busy. You are not off the hook if you have children, work three jobs or run a small empire. You can pick up the phone once your kids are in bed, and call your depressed friend. You can write them a kind “thinking of you” email or text before your big meeting. You can invite them over to hang out while you cook Monday’s dinner and supervise math homework. You can BE THERE. Silently offering tissues as they cry for reasons that seem silly or even illogical to you. How much does it matter? A LOT. How do I know? Well, I was once very close to someone who was going through Clinical Depression and Anxiety. And, since February, I have suffered from Depression myself. On both sides of this situation, I’ve made a lot of mistakes. As the loved one of someone with a mental illness, I did not ask for help. I did not ask my loved one’s friends to drop by and play board games with him, I did not ask his family for support. For my own bout with Depression, out of which I am thankfully emerging, I did not seek treatment as soon as I should have, which destroyed a very important relationship. I did not ask for all the hugs and listening and care I needed from my family and my friends. I was scared to do that. I didn’t want to be a burden. Sometimes that feeling of not wanting to be a burden can transform into something darker–such as suicide. Robin Williams was a gifted actor. In his roles, he showed us all the humour and pathos of the human condition. But living so close to these extremes of dark and light, alive to the very marrow and poetry of existence, is often perilous. We need to remember that even the very gifted can suffer. Even they need both treatment AND support. This entry was posted in Uncategorized by andrearaymond2014. Bookmark the permalink. Thank you for sharing your experience and making such helpful suggestions on how we can help those around us. I think everyone knows someone who can use some support and you have given some insightful, practical and very helpful tips. It is just to easy to say “I don’t have time” but we make time, the result of our kind gestures can be very powerful. Your brief and personal account on depression speaks volumes about getting us all back to the roots of being human, Andrea. Thank you for this. Andrea, this is a heartfelt and moving post. You are a very special and wonderful lady. Thank you for writing with honesty and compassion.